First, you can organize a group training session before or after work. It must be mandatory (and you’ll have to pay them for their time) but it’s worth it in the long run to clean and organize your workspace; the added efficiency means you’ll be getting more out of your workers during the day and spending less on maintenance. For this kind of session, you should have a mix of visual aids (training videos, PowerPoint presentations, etc.) and hands-on learning. One thing you need to keep in mind is every human being has a different learning style. Some learn best by watching or reading, some learn best by listening, and some learn best by doing. Incorporating all three types of learning into your training (and this applies to any kind of training) will ensure that every employee gets it by the end of training, and none are left lagging behind. Alternately, you can have training sessions during the normal workday, taking individual employees aside and training them on the methods in a comparable way to the above to be put into practice. The downside to this is you either need to have a dedicated trainer on hand until your whole staff is trained, distract the manager or supervisor for a lengthy period of time, or make do with only training videos and computer exams, which may leave holes in your training. But for some businesses, this may be the only option you have for various reasons. You should make sure you follow up on this training regularly to make sure standards don’t begin to slip. Once the initial training wave has been completed and practices to Sustain the cleanliness and organization have been successful, things become much easier into the future. Once all existing employees are trained, new employees can be trained using only memorization of your standards through video training and tests, and then the other employees can ensure it sticks with them by showing them during the natural course of the work day. This works best if you assign new employees to shadow a more experienced worker for a while, so that they can be shown the ropes without significantly impacting workflow. Do this even if the new employee is an experienced member of the industry, and even if they are already 5S trained; the way things are done at your company or job site may be subtly (or even radically) different from how they’re used to doing things, and this time should be used to train them out of bad habits, or habits that served them well in their previous job but don’t mesh with your processes. Effective training methods are the most important thing when it comes to maintaining that Sustained long term cleanliness you need for your business. 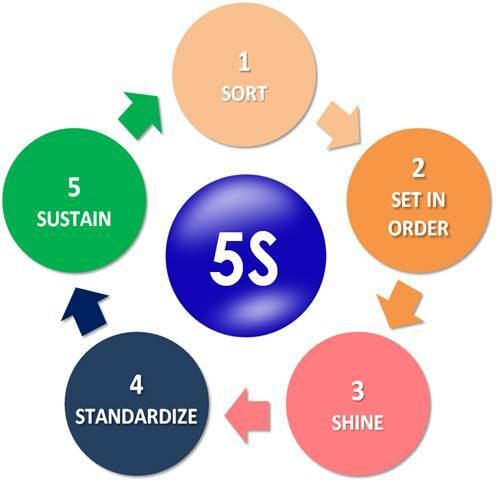 Don’t be afraid to engage those under you in a one-one-one to work on any flaws in the training; employees can often be insightful on what about training works and what needs to be changed, and incorporating that feedback is an important part of Kaizen: Changing for the better, which is what 5S is all about. Previous post: What is a Gemba Walk? Next post: What is Autonomous Maintenance?